A Swiss geologist named François de Loys photographed this creature in Venezuela sometime around 1920. 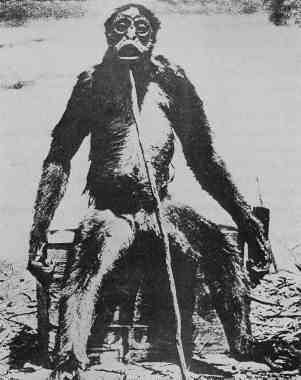 He claimed that the creature was a tailless, five-foot tall ape which he had encountered (and killed) in the jungle. The problem is that apes are not native to the Americas. The actual finding of one would have thrown the entire theory of primate evolution into disarray. Therefore, the scientific community concluded this photo was a fake. Read more here.